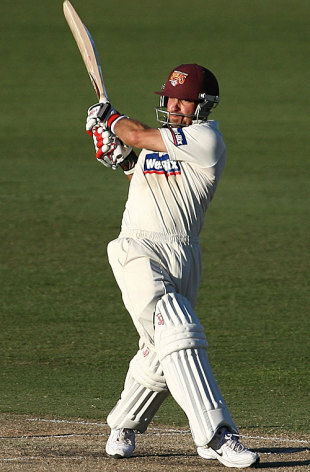 Chris Hartley protected Queensland with a courageous century on the final day that ruined Tasmania's chances of victory. For a short time after Hartley's 112 the Bulls were a chance of a miracle win, but the game ended in a draw after the hosts ditched their dreams of chasing 238 in 37 overs. Hartley started the day on 26, with Queensland's lead at 58 and only five wickets in hand, and didn't leave until he was lbw to Rhett Lockyear just before tea. His 255-ball resistance eased Queensland's concerns as they posted 338, and then it was the Tigers who were worried at 5 for 101 following an aggressive start. Dan Marsh showed his experience to guide the side through a difficult patch with 49 not out and the game was called off four overs early. Ben Cutting added two wickets to collect eight for the game while Chris Swan backed up with two victims after a crucial contribution from No. 10. The Bulls stay in second while the fifth-placed Tasmania, who gained two points, are almost certainly out of the race for the final with three rounds to go. Queensland's innings ended an over after Hartley departed when Swan fell to Tim Macdonald on 41. Swan provided valuable assistance in a 99-run stand with Hartley that extended the lead and reduced the amount of time Tasmania had to chase. Hartley's second hundred of the season put him third on the run list with 643 at 45.92 and earned him a state record for the biggest summer haul by a gloveman. It was a busy match for Hartley, who scored 68 on the opening day in his initial rescue act, and took six catches in Tasmania's first innings. The Bulls lost three wickets in the opening session, with Nathan Reardon bowled by the impressive Brendan Drew, who returned 4 for 81. Chris Simpson, the captain, stayed for 8 and Ben Cutting (16) was out pulling Drew to signal the lunch break. The home side's joy slowly turned to disappointment.